But first the commonwealth needs to get a grip on its $73 billion debt. Can Gov. García Padilla sell hedge funds on a restructuring deal? Nestled in the Cayey mountains, a little over an hours drive from San Juan, sits the municipality of Aibonito. To get there you leave Puerto Ricos sandy beaches behind and take a winding road that snakes through miles of rain forest before reaching the areas semitropical ecosystem, 2,400 feet above sea level. The damp, temperate climate is ideal for agriculture, and for decades horticulture was Aibonitos major industry. Not anymore. In these hard times few people buy flowers. In the towns main square, dominated by the brilliant white Church San José of Aibonito, a smattering of pensioners pass the time on benches while dogs roam freely. A man wearing a black suit, tie and fedora stands on the corner holding a Bible, preaching in Spanish and gesticulating wildly with his arms. He seems like a character out of the pages of a Graham Greene novel. But this is not Greenes Havana or Panama. Its not even Latin America. As one of the 78 municipalities that make up the Commonwealth of Puerto Rico, Aibonito is part of the United States of America. Yet this island, just over 1,000 miles southeast of Miami, has a peculiar relationship with the U.S.  one that clouds its future. Puerto Ricos open access to the vast U.S. market is its greatest source of commercial opportunity, but its lack of voting representation in Congress has left it with little influence over the tax breaks and military contracts that historically have played a big role in its economy. The result is a stagnant, subsidy-dependent territory that has an aging population, with 42 percent of its residents receiving some form of welfare. The realities are all too obvious to William Alicea Pérez. The 43-year-old mayor of Aibonito tells Institutional Investor that his constituents need jobs and resources to care for the elderly. Unemployment in Aibonito exceeds 15 percent, and more than 14 percent of the municipalitys population of 25,900 is aged 65 or over. Since 1980, Aibonito has transformed from having a 57.9 percent rural population to one that is 88 percent urban. But jobs in the town  two of the three major employers are a Baxter International pharmaceuticals packaging plant and a Pilgrims Pride Corp. chicken-­processing facility  are under threat because of the expiry of U.S. tax incentives, increased automation and global competition. Aibonitos problems, mirrored in towns across Puerto Rico, are at the root of an economic and debt crisis that has the commonwealth perched on the edge of an abyss. Since 2006 output has contracted by 10 percent and the economy has lost more than 250,000 jobs, an astonishing number for an island of 3.5 million people. The U.S. beckons as a land of opportunity for many of Puerto Ricos best and brightest, who are leaving in increasing numbers to seek their fortunes in America. In June, Governor Alejandro García Padilla shocked financial markets by announcing that Puerto Rico was in debt to the tune of $72 billion. That figure, which the administration later raised to $73 billion, was higher than many investors realized. The commonwealth would need relief from creditors to survive, Padilla said. He hired high-­powered advisers, including Anne Krueger, a Princeton University expert on sovereign debt restructuring and a former No. 2 official at the International Monetary Fund, and Jim Millstein, founder and CEO of restructuring advisory firm Millstein & Co., and entered into debt restructuring talks with bondholders. In September the Puerto Rico Electric Power Authority, a public entity, reached an agreement with creditors to restructure $8.6 billion in bond debt of its major power utility. The commonwealth and its investors remain far apart on other debts, but they have little time to spare. The Government Development Bank for Puerto Rico (GDB) faces a $267 million debt payment on December 1, and the commonwealth itself has $1.2 billion in payments coming due in January. In August a GDB subsidiary, Puerto Rico Public Finance Corp., defaulted on a $1 billion bond issue by missing a $58 million interest payment, a first for a commonwealth entity. Critics of the Padilla administration insist the island can meet its obligations; they say its government just doesnt want to bite the austerity bullet. Puerto Rico is not Greece, says Charles Blitzer, former assistant director of the IMFs monetary and capital markets department. Ive never seen a fiscal crisis that on paper looks easier to overcome with the least damage to everyone. The islands debt-to-GDP ratio is 65 percent, according to government figures, well below the U.S. level of 105 percent and much lower than Greeces 177 percent or Japans 246 percent, according to IMF data. Puerto Rico is not a country, however. It doesnt have its own currency or central bank, which allow independent nations to sustain higher debt levels, and it cant borrow from the IMF. Investors regard Puerto Rico as they do U.S. states, which also finance themselves in the municipal bond market. By that measure, the commonwealths debt is off the charts. New York State, the most indebted of the 50 states, has total state and local debt of 24.24 percent of output. Even troubled Illinois has a ratio of just 18.61 percent. Puerto Ricos debt isnt just large; its extraordinarily complex, which complicates efforts to find a solution. After rating agencies downgraded the commonwealths debt to junk levels in 2014, closing off access to the U.S. muni market, Puerto Rico borrowed $3.5 billion from hedge funds at a rate of 8.73 percent. Altogether hedge funds hold an estimated 14 percent of Puerto Ricos debt. For the most part, hedge funds own the islands most senior debt, including general obligation bonds, GDB debt and bonds issued by the Puerto Rico Sales Tax Financing Corp., known by its Spanish acronym, COFINA. Hedge funds have scooped up debt at steep discounts  the islands GO bonds due in 2035 trade at about 76 cents on the dollar, according to UBS  and they are insisting on payment in full. A hard-line stance could keep Puerto Rico frozen out of the capital markets just like Argentina, which has been unable to complete a debt restructuring because of holdouts led by New York hedge fund firm Elliott Capital Management. My view is Im constitutionally senior, I know theyve got the money to pay me, so Ill just wait for my check, thank you very much, says one New York hedge fund manager who owns Puerto Rican bonds. This manager believes the commonwealth could close much of its funding gap if it was more efficient in collecting taxes owed and cutting nonessential expenditures. THE SHOWDOWN IS TAKING PLACE against the backdrop of the 2016 elections, both in the U.S. and on the island; this seems likely to complicate efforts to find a compromise. In Washington, Republicans Orrin Hatch, chairman of the Senate Finance Committee, and Lisa Murkowski, who heads the Energy and Natural Resources Committee, have indicated a willingness to help Puerto Rico, but key Republican members of the House of Representatives have been more skeptical. In June, House Judiciary Committee chairman Bob Goodlatte and committee member Thomas Marino said that granting Chapter 9 bankruptcy protection would not, by itself, solve Puerto Ricos difficulties, which are associated with underlying, structural economic problems. The Republicans generally have stressed the need for transparency and an understanding of how Puerto Rico got into its present condition. Critics of the Padilla administration accuse the governor of exploiting the debt crisis to further his reelection ambitions and those of his left-leaning Popular Democratic Party. Padilla long insisted that Puerto Rico would never default on its constitutionally protected debt, says Marcos Rodríguez Ema, a lawyer, banker and member of GOP-­affiliated opposition group the New Progressive Party, who served as chief of staff to Padillas predecessor Luis Fortuño. Then, he says, within a span of two months and after hiring the same people who have been advising Argentina, all of a sudden Puerto Rico does not have money to pay the bills, he says. Whatever the outcome, the commonwealth will have to tighten its belt, which will likely mean public sector job cuts and tax increases. But a crisis of this magnitude is also an opportunity: It could force Puerto Rico to change its ways and fix its ailing economy. A number of entrepreneurs are already hard at work, hoping to benefit from the turnaround opportunity. 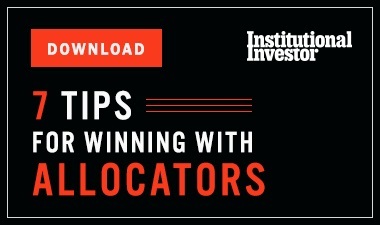 Other investors are seeking to take advantage of two pieces of legislation Puerto Rico adopted in 2012: Act 20, which provides tax incentives for exporters of services ranging from research and development to legal and accounting work to call centers, and Act 22, which offers a full tax exemption on all passive income to investors who become local residents. So far, about 1,000 nonresident Puerto Ricans have relocated to the island under Act 22. SAN JUAN SITS ON THE ISLANDS northeast coast. The second-oldest European-­established capital city in the Americas after Santo Domingo in the neighboring Dominican Republic, it was founded by the Spanish in 1521, almost two decades after Columbus claimed Puerto Rico for the Spanish crown. In Old San Juan, La Fortaleza, a fort built between 1533 and 1540 to defend the harbor from the British and Dutch, serves as the governors residence and is one of only ten UNESCO cultural heritage sights in the U.S. Ceded to the U.S. after the Spanish-­American War of 1898, Puerto Rico was ruled as a virtual military outpost for half a century, with a governor appointed by the White House. After World War II the island officially became a commonwealth; residents elected the first popularly chosen governor, Luis Muñoz Marín, in 1948. Marín worked with Washington on Operation Bootstrap, a program of tax and regulatory incentives that fostered the industrialization of what was then an agrarian society. To encourage this effort, Section 936 of the U.S. tax code was adopted in 1976, making tax exempt all income earned by U.S. companies operating in U.S. possessions. A 1993 study by the General Accounting Office found that Puerto Rico reaped 99 percent of the tax credits extended under that provision. Beginning in 1994, however, the U.S. began phasing out 936 tax credits because of pressure from mainland interests, and it abolished them entirely in 2006. The loss of tax benefits, combined with heightened competitive pressures as a result of the North American Free Trade Agreement, led many industries, notably petrochemicals and electronics, to pull out. The fallout from the 200809 financial crisis and the long period of high oil prices  Puerto Rico imports virtually all of its energy  added to the pressure. As a result, the islands economy has been shrinking for most of the past decade. Manufacturing jobs have fallen by 53 percent since 1990, to some 74,000 today. Only about 40 percent of the working-age population is employed or seeking work, compared with 63 percent in the U.S. The biggest employer, by far, is government. The one bright spot, pharmaceuticals, accounts for more than 20 percent of GDP. The result is a vicious circle: The loss of jobs has sparked a growing flight of younger people, causing the population to shrink from more than 3.8 million in 2006 to 3.5 million today. Those left behind are older, poorer and more dependent on government benefits, which in turn drives up the debt. The Puerto Rican government had more than a decade to prepare for the end of 936 tax credits, yet they did nothing, says John Mudd, a prominent local attorney. The government did do something: It raised funds from the muni market. The results were dramatic. 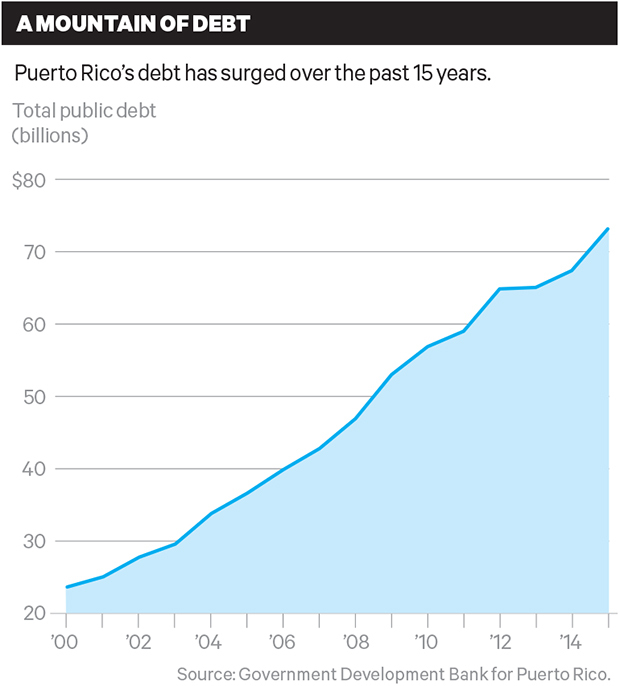 Puerto Ricos debt has nearly doubled since 2005, when it stood at $37 billion, according to data from the GDB. The government continued to spend freely during this time, relying on borrowing and skipping pension contributions. By 2013 the funding ratio of the Employees Retirement System of the Government of the Commonwealth of Puerto Rico was a mere 3.1 percent. The financial advisers to the government of Puerto Rico were effectively the municipal desks of Wall Street, says Liam Localio, an associate and Latin American specialist at hedge fund firm Greylock Capital Management, speaking at a conference in New York. At the time, Puerto Rico still enjoyed a strong credit rating and a perfect payment record. Investors liked the high yields the commonwealth offered and the fact that any state-specific muni bond mutual fund could invest in Puerto Rican paper. It was like the joker in a pack of cards, says a municipal bond investor. 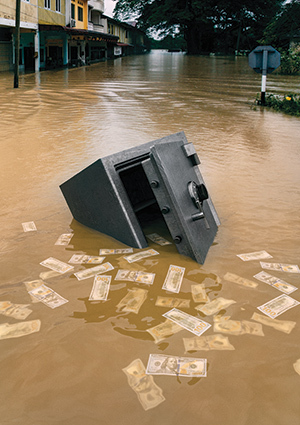 Wall Street banks were only too happy to underwrite the debt boom and reap the fees. Those circumstances explain how a poor island (with a poverty rate exceeding 45 percent) that would rank 30th among U.S. states by population was able by 2013 to become the third-largest issuer of municipal bonds in the U.S., behind only California and New York. In 2009, Fortuño came into the governors office, facing a record budget deficit of $3.3 billion. In the winter of 2008, before he was even sworn in, the governor-elect flew up to New York to meet with bondholders and the rating agencies. I told them in six months wed do what had to be done to straighten out the economy, he tells II. Fortuño did make some budget cuts, and GDP growth resumed for a time, but the austerity measures contributed to his 2012 election defeat. 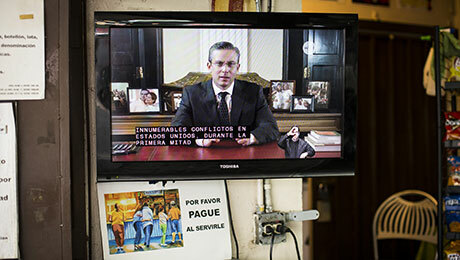 Governor Padilla barely had time to measure La Fortaleza for new curtains when, in March 2013, Standard & Poors cut the credit rating on Puerto Ricos general obligation bonds to BBB, the lowest investment-grade rating, saying it was worried that the island would not be able to close its $933 million budget gap that year. The hedge funds started to move in. Then, in February 2014, S&P cut the commonwealths rating to junk. It has made several subsequent downgrades  most recently in July, with a one-notch downgrade to CCC, a level signaling a likelihood of default within six months. The biggest losers from a default wouldnt be the hedge funds. More than 20 percent of the commonwealths debt is held by local investors, both retail and institutional. The islands 116 credit unions collectively hold some $1 billion of Puerto Rican paper, which could spread the impact of a default throughout the financial system. More than 25 percent of the debt  roughly $20 billion  is held by U.S. retail investors, either directly or in mutual funds. 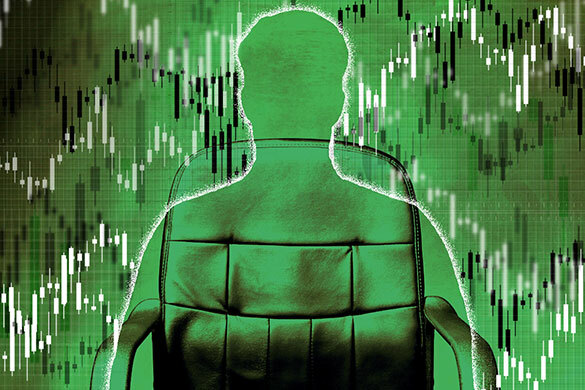 Mutual fund managers Oppenheimer­Funds and Franklin Advisors hold about $10.8 billion. Unlike the hedge funds, they acquired most of their bonds at about par, so their losses in the event of a default could be severe. 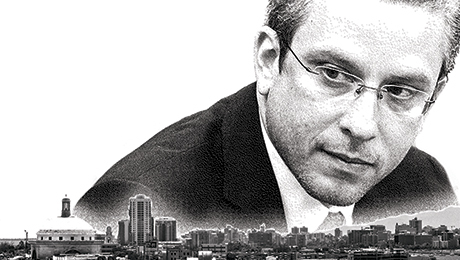 PUERTO RICO COULD DO WORSE than attract investors like Paulson. Two years ago Paulson & Co. acquired a majority stake in the St. Regis Bahia Beach Resort, a luxury resort and planned community 20 miles east of San Juan, when local developers ran short of cash. The property boasts two miles of pristine, sandy beachfront and sits on almost 500 acres of lush maritime forest. It includes freshwater swamps, mangrove forests, marsh lakes, coconut plantations and coral reefs. Leatherback turtles spawn on the beach. The resort is the only certified-­gold Audubon Society sanctuary in the Caribbean. It includes a luxury St. Regis hotel, operated by Starwood Hotels & Resorts Worldwide, and a golf course designed by Robert Trent Jones. Prices for condominiums start at about $800,000; beachfront villas with uninterrupted views of surf and sand are listed at $10 million to $12 million. Paulson himself is building a modern glass, steel and concrete house on the seafront, which is due to be completed in December. Jonathan Lassers, a Scot who made money in London real estate in the 1980s and spent recent years in Uruguay, moved to Puerto Rico this year to take advantage of the Act 22 tax incentives. He has teamed up with two local partners, Gualberto Rodriguez, president of Caribbean Products, the largest produce distributor on the island, and Alexander Borschow, a businessman and son of prominent Puerto Rican entrepreneur and philanthropist Jon Borschow, to invest in agriculture in Puerto Rico, including the area around Aibonito. A legacy of Puerto Ricos recent industrialization is that it produces very little of its own fruits and vegetables  fully 85 percent of food consumed on the island is imported. It takes at least 11 days to import a head of romaine lettuce from California, and the Jones Act shipping restrictions add to the cost. (Those costs look set to rise: In September one of the two ships that bring food to Puerto Rico sank in Hurricane Joaquin.) Yet the island has large swaths of agricultural land lying fallow. Borschow and his partners have identified a farmer who can grow romaine for one-third less. Investing in local produce may not only be a source of jobs and income, Lassers says, it may reduce the islands food bill and eventually generate export revenue. Visit Imogen Rose-Smiths blog and follow her on Twitter at @imogennyc.